Merseyside-born Donnelly joined Argyle from Skelmersdale United with the reputation as a prolific non-league goalscorer, having also spent periods with Liverpool, Everton and Accrington Stanley as a boy. 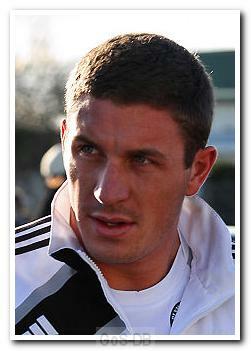 He briefly left Skelmersdale in 2005-06 to join Runcorn Town before returning the following season. He spent a week on trial at Home Park, playing in a reserve game, and the move was finally completed for an undisclosed fee in March 2009 after months of speculation. An injury during his first pre-season interrupted Donnelly's progress and he spent a month on loan at Luton Town, followed by another temporary move to Stockport County for the final three months of the season. Despite a more productive 2010-11 pre-season, he returned to Stockport on a six-month loan deal before the start of the campaign and after returning to Home Park was sold to Fleetwood Town for a reported £50,000 fee – then a record for The Trawlermen. Donnelly made his debut for Fleetwood in January 2010 and went on to score five times in 25 games, and was also capped by England ‘C’ against Portugal in May 2011. He then became the target of an unusual modern-day transfer bid from one of his former clubs: Stockport County, via their Twitter account, asked their fans which forward they would like to sign. Donnelly won the vote and County's chairman entered into discussion with Fleetwood, but was unable to agree terms. Perhaps unsettled by the social media transfer buzz, he was eventually loaned to Macclesfield Town in September 2011, where he scored three in 13 appearances as the club battled for its Football League status. His loan was made permanent on New Year’s Day 2012, signing a two-year deal with Macclesfield for an undisclosed five-figure sum. He went on to play a further 15 times that season and score another three goals, including an injury-time equaliser to salvage a point for the Silkmen in their home match with Argyle. At the end of the campaign, with Macclesfield dropping out of the League, he signed a two-year deal with Rochdale for another undisclosed five-figure sum. The lively, powerful striker helped Dale win promotion to League One under former Argyle defender Keith Hill in 2014. Barely into the new season at Spotland, Donnelly dropped down a division to return to his roots at Tranmere Rovers on a two-year deal for another undisclosed fee. Donnelly failed to score in 13 appearances for Rovers, before moving up the coast in January 2015 to Conference side Southport on loan until the end of that season. In total he made 16 appearances and scored one goal. Later in 2015 he returned briefly to Northern Premier League Premier Division (tier 7) side Skelmersdale United before signing for AFC Liverpool in the North West Counties League Premier Division (tier 9) - a team formed in 2008 by 1,000 supporters disenfranchised by Liverpool FC (the AFC prefix of their not-for-profit organisation standing for Affordable Football Club).